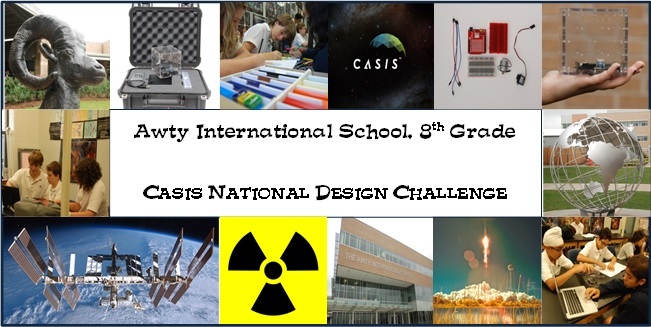 On February 18, the international section of 8th grade voted on two designs for the mission patches. The winning patch will be announced soon. The engineering team has temporarily stopped working on the ground-based experiment, a prototype for the real Ardulab (the ground-based experiment will be running here on earth at the same time that the Ardulab is running in space). The team will continue work on the ground based experiment as soon as they receive further instruction on wiring. Until then, they have started testing the motors, epoxying them, and soldering them. The artistic team has started to narrow down the options for t-shirt designs. By the 21st, they will have three. The international section of 8th grade will vote on their favorite t-shirt design next Monday (the 24th). We got back from Christmas break and we received our new motors. We have been testing the motors and working out the coding bugs. All the paperwork is completed. The spreadsheet is done for all the things that are going to be in the Ardulab. We have also been communicating with Brian from SparkFun. Colton and Austin gave us the wiring diagram for the Ardulab. Students were also working on the TEDP. Photo/Video Team: They are re-filming the commercial because the first commercial was not working out. They are also taking pictures of the class. Portfolio Team: They are still organizing the portfolio. They are also placing the engineering blueprints and sheets of materials into the portfolio. Programming Team: They are testing and researching to make sure that everything will work and anything else that involves programing. Public Relations Team: We are creating a photo gallery for CASIS by importing pictures given to us by Ms. Glidewell. We are also going around gathering info from groups on what they are doing. Engineering Team: They are trying to find a smaller breadboard. They also put a Geiger tube in the box, drilled holes in the box, and put motors in. They are overall just trying to get some of the construction done. Artistic Team: They have finalized 3 different patch logos for t-shirts and intend to discuss with the other classes in order to find the final design. They are also finding a design for the t-shirt itself. Colton and Austin, from Texas A&M, talk to the programming and engineering teams about the Ardulab box. The students from the programming and engineering teams ask Colton and Austin if they have any ideas that will help the students construct the Ardulab. Jordan Penchas examines the Ardulab while Adham Metwalli listens to Colton and Austin. "In our design, the motors will rotate 90° every time we want to collect data. The sheets will be attached to their respective motors." These are the possible designs for our mission patch. This chart represents the design matrix that the classes evaluated for each of the designs that had been created. Each of the 3 classes were broken into 6 groups each who then completed an evaluation and then the results were complied into this chart. The obvious winner was design #2. This week has mainly been focused on the Engineering Team. They are going to apply a Design Matrix for the top three designs for the project. As a class, we will also look at each of the three designs and look at the pros and cons of each designand decide on the final design for the project. Also this week on Friday, Jordan Penchas and Ms. Glidewell were interviewed by Discovery Channel Canada for a possible TV segment. Engineering Group - they are reviewing the dimensions of Ardulab box and making sure the experiment will fit in it. They are making sure that the materials being used for experiment will work. They are also sketching out where each part will go in the box. That way, they will have an idea where the materials will go and where. Artistic Group - the artistic group has been working on logos that will represent Awty in the experiment. They are planning to take these logos and make patches that can be ironed onto the shirts and jackets. They have many ideas and designs for the patches. They plan to either combine what they think to be the three best patches and make one amazing one or pick the one they think is the best. Programming Group - they are collecting data, such as codes, for the experiment. They have found codes for the timer and how to collect data. They are currently looking for codes that will control the camera, like turning the camera on and off automatically. Portfolio Group - portfolio manegement has been very busy. They have been organizing and thinking about everything that has to do with the experiment. On the first day, they were organizing all their information about the supplies they will need for the portfolio and what they will put in it. They have been gathering tons of information from other groups. For example, they have gathered blueprints from the engineering group and artwork and design from the artistic group for the portfolio. Photo/Video Group - they have been all around the classroom taking pictures of each group. Thanks to the their group, we have all the pictures for the newsletter. Almost all the pictures on the newsletter were taken by the Photo/Video Group. Jordan Penchas was featured in WIRED Magazine Online this week. See the article below. When Jordan Penchas started hacking some electronics hardware so he could play an absurdist surgery game with his Wii Nunchuk controller, he had no idea it would lead to a ride on the International Space Station. Penchas is a 13-year-old eighth-grade student who lives in Houston, Texas. Late last year, a friend gave him an Arduino Uno — a $30 open-source computer motherboard that’s popular with the hardware hacking set — and at first, he used it as a kind of middleman between his Nunchuck and a game called Surgeon Simulator. Typically, you play the game with keyboard. If you master certain keystrokes, you can remove virtual organs from virtual patients, often to twisted comic effect. But Penchas thought this was awkward and clumsy, so he used the Arduino to plug the Nunchuk into the game instead, and things got much easier. He even impressed his older brother. But the next step is far more impressive. In June, his latest Arduino hack will end up on the International Space Station. His school, Awty International School, was one of three selected to try out a new type of space science kit. It’s called ArduLab, and basically, it lets Penchas and his classmates build experiments to run on the space station. Created by a Silicon Valley startup called Infinity Aerospace, the programmable lab-in-a-box shows just how much open-source software can shake things up — even in space. NASA has long used things called CubeSats to run experiments in space, but Arduino further democratizes this sort of thing. It’s far cheaper and easier to use, putting the power in hands of people as young as Jordan Penchas. Down on earth, hackers like Penchas can pre-program sensors and test equipment so that the Space Station astronauts don’t have to manually turn dials up in space. They can even remotely connect with their experiments. That’s a big deal because it leads to self-managed experiments in space, says Laura Colville an Education Specialist with the Center for the Advancement of Science in Space, the nonprofit group that manages the International Space Station’s U.S. laboratory. “The one critical thing up there is crew time,” she says. 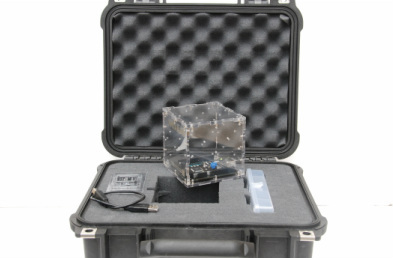 The 9 cm tall ArduLab starts at $2,000, while conventional CubeSat kits can run five times that price. For just $5,000, Infinity Aerospace plans to give you the kit plus a four-minute ride on XCOR’s Lynx suborbital rocket. “With our offerings, any school… can transform its lab into a fully equipped space lab with guaranteed launch slots,” said Manu Sharma, one of Infinity Aerospace’s founders, in an email interview. There are already hundreds of sensors and devices that work with Arduino, and the open source code that runs on the hardware is freely available for anyone to play around with. Penchas and his fellow students are designing an experiment that will test the effects of graphene as a radiation shield and they also want to study the growth of algae in zero gravity. They’re still working out the details of their experiments, but whatever path they take, it’s almost certainly going to be a little easier, thanks to open source. 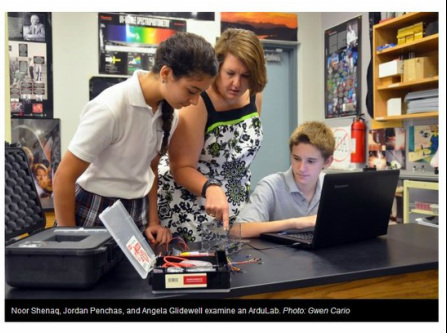 “If there’s a certain thing that you want to do or a certain sensor that you want to use, somebody else has already written the stuff for it and you just have to go snag it,” says Penchas’s physics teacher, Angela Glidewell. Penchas, like all little brothers, is pretty competitive with his older sibling. He still remembers the “look on his face of complete surprise” when his 17-year-old brother saw his Nunchuk hack. He hopes to do even one better in space. “My one competitive up-move is that I’m a maker,” he says. The team had to continue the construction over the summer but the project was completed!! The coding was also completed by Ms. Angela Glidewell with the aid of Colton. The project was up and ready to go for the flight on September 9th! But the flight was not exactly on September 9th. It was delayed to October 8th, then October 20th, then October 21st, and was finally decided to launch on October 27th. The rocket was ready to go on October 27th, until a boat decided to sail into the danger zone. The flight was then delayed again and moved to October 28th. As most of you may have heard, the 140-ft Antares rocket exploded a few seconds after the launch. The team, who are now in the ninth grade, and Ms. Glidewell were very heartbroken at the site of their project exploding. Below is a link to the abc13 article about the explosion.